The “irregular congestion” will be caused by some large scale events which are held in the specific region, such as a fireworks display or a sport game. Since it is strongly needed to avoid the risks of crowd accidents in the irregularity or it might have a good business opportunity with quite a few people, a lot of research about the irregularity detection has been reported. It is obviously insufficient, however, only to detect the irregularity because there is not enough time to take countermeasure against the irregularity. Therefore we focus on transit app’s logs where we model the correlation between the number of people who searched the route in advance of the event and the number of those who go to the event. 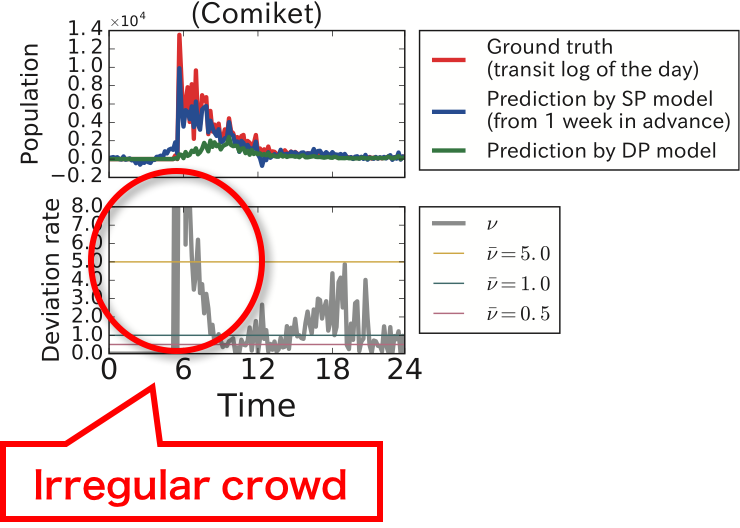 In this paper, we finally reported that we could precisely predict the holding of some very large scale events, such as “Comiket” and “Fireworks display on the Tokyo Bay”, in advance of a week ago. Besides the countermeasure against the congestion following a large scale event, the business targeting the crowd could be improved effectively by our achievement. The 2016 ACM International Joint Conference on Pervasive and Ubiquitous Computing (UbiComp 2016), pp. 752–757, 2016.